Hawai’i County Council Bill 112, Relating to Rooster Farms, was heard at the Hawai’i County Building on Tuesday, March 13, 2018. 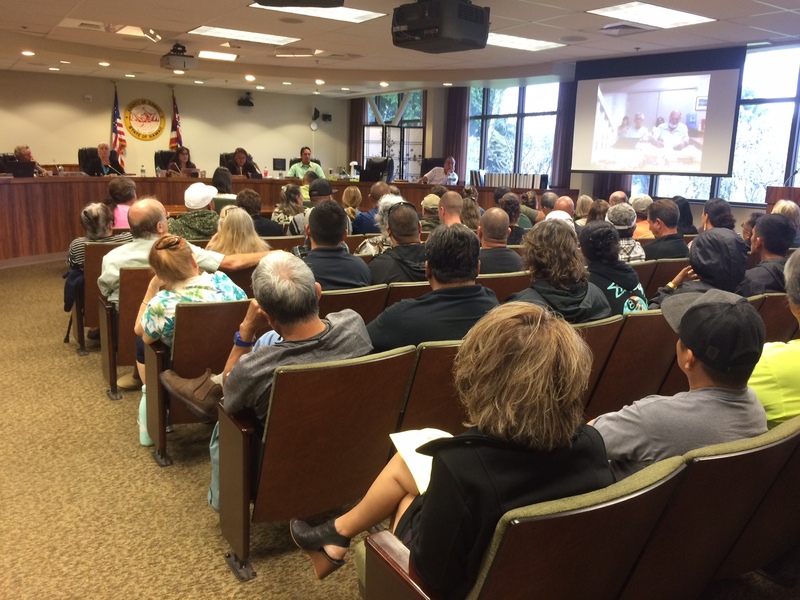 Irate rooster farmers showed up in full force to provide their testimony against the bill presented by Puna Councilwoman Eileen O’Hara. 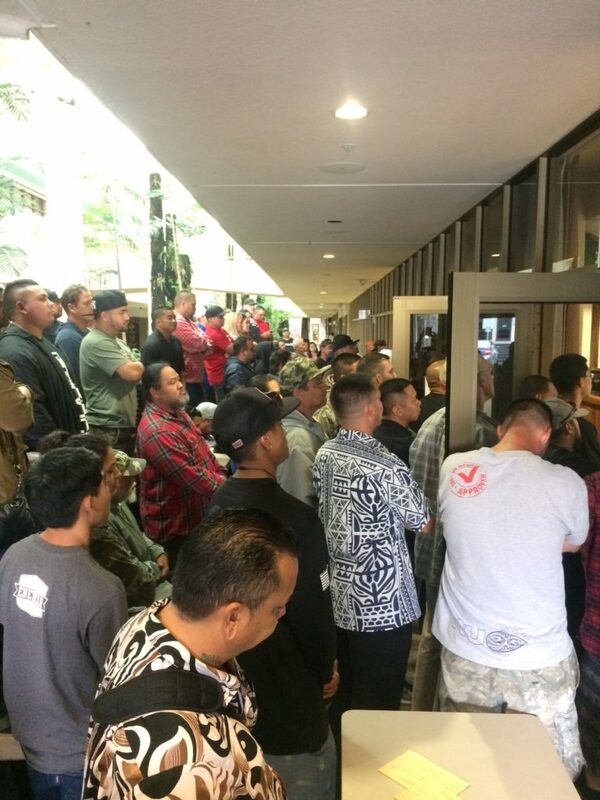 Overflow crowd at the Hawai‘i County Council chamber. The bill died a short death after no other council members would second the bill. Sorry to say, but the Council Chair had made up her mind on this issue long ago and today’s hearing was set up to fail. The County Clerk’s office didn’t bother to send out the 77 supportive written testimonies which were sent in on time until after the end of the business day yesterday. We only had 26 written testimonies in opposition. None of the councilmembers read them. The councilmembers already had their minds made up. Quantitatively, there were more supportive testimonies than opposed, but given the emotional pitch of the rooster farmers in the room, none of the other councilmembers showed any sympathy for the excellent testimonies provided by supporters because none were “local”. I know some locals who supported the bill, but who were afraid to testify for fear of retribution. I got personally attacked by several testifiers because they claimed I hadn’t consulted with them even though I went to HPP with copies of the Bill fresh off the press for their Feb. 25th member meeting knowing the rooster farmers would show up. HPP staff, Ms Bronson-Crelly, put the issue last on the agenda and didn’t bother to notify my office, but I got wind of it. Waited 3.5 hours to talk with them and they just started yelling and making threatening remarks so had to leave. Sorry, but the County prefers to ignore the problems of Puna as out of sight, out of mind. Meantime, the rooster farmers stormed into the Dem Party’s District 4 meeting last week and elected themselves to all precinct and state delegate positions. Now that they’ve defeated this bill, I don’t expect to see them again at a political caucus. Kind of like the millennials that stormed in two years ago to support Bernie, but who left the party as soon as he didn’t win the primary. The bill died. None of the councilmembers would second a motion to pass it on. That may be best as the rooster farmers were revved up to a frenzy and if it had continued, I would have grown tired of checking in my rear view mirror to see who might be following my car home. Very intimidating. I came home to Pāhoa to find my two banners that owner William Quinn allowed me to put up at the feed store gone…..that’s $60 I just paid to stand against the rooster farmers. I hope this attempt won’t de-rail my attempts to get re-elected, as there are other ways to tame the beast and other fish to fry to help Puna along.